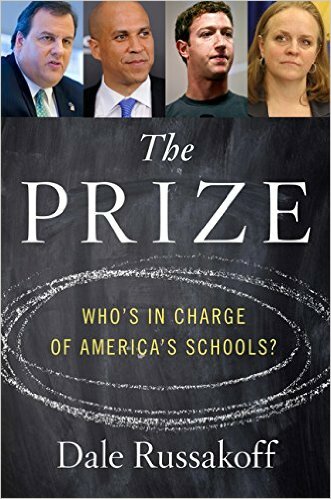 Betting on People: An essay review of Dale Russakoff’s The prize: Who’s in charge of America’s schools? Betts, J. R., Zau, A. C., & King, K. (2005). From blueprint to reality: San Diego’s education reforms. San Francisco, CA: Public Policy Institute of California. Boyd, W. L., & Christman, J. B. (2003). A tall order for Philadelphia’s new approach to school governance: Heal the political rifts, close the budget gap, and improve the schools. In L. Cuban, & M. Usdan (Eds.) Powerful reforms with shallow roots: Improving America’s urban schools. (pp. 96-124). New York: Teachers College Press. Bryk, A. S., Sebring, P. B., Allensworth, E., Luppescu, S., Easton, J. Q. (2010). Organizing schools for improvement: Lessons from Chicago. Chicago: University of Chicago Press. Cibulka, J. G. (2003). The city-state partnership to reform Baltimore’s schools. In L. Cuban, & M. Usdan (Eds.) Powerful reforms with shallow roots: Improving America’s urban schools (pp. 125-146). New York: Teachers College Press. Cuban, L. (2010). As good as it gets: What school reform brought to Austin. Cambridge, MA: Harvard University Press. Cuban, L., & Usdan, M. (2003). Powerful reforms with shallow roots: Improving America’s urban schools. New York: Teachers College Press. Elmore, R. F. (2004). School reform from the inside out: Policy, practice and performance. Cambridge, MA: Harvard University Press. Hess, F. M., & Sattin-Bajaj, C. (2013). Blueprint for school system transformation: A vision for comprehensive reform in Milwaukee and beyond. Lanham, MD: Rowman & Littlefield. MacFarquhar, N. (1995, April 13). Judge orders takeover of Newark the school district. New York Times. http://www.nytimes.com/1995/04/14/nyregion/judge-orders-a-state-takeover-of-the-newark-school-district.html. Retrieved 12/1/2015. Mirón, L., Beabout, B. R., & Boselovic, J. L. (2015). Only in New Orleans: School choice and equity post-hurricane Katrina. Rotterdam, Netherlands: Sense Publishers. National Research Council (2011). A plan for evaluating the District of Columbia’s public schools: From first impressions to evidence. Division of Behavioral and Social Sciences and Education. Washington DC: The National Academies Press. O’Day, J. A., Bitter, C. S., & Gomez, L. M. (2011). Education reform in New York City: Ambitious change in the nation’s most complex school system. Cambridge, MA: Harvard Education Press. Orr, M. (1999). Black social capital: The politics of school reform in Baltimore, 1986-1999. Lawrence, KS: University of Kansas Press. Reville, S. P. (2007). A decade of urban school reform: Persistence and progress in the Boston Public Schools. Cambridge, MA: Harvard University Press. Russo, A. (2004). School reform in Chicago: Lessons in Policy and Practice. Cambridge, MA: Harvard University Press. Shipps, D. (2006). School reform, corporate style: Chicago 1880-2000. Lawrence, KS: University of Kansas Press. Yee, G., & McCloud, B. (2003). A vision of hope: A case study of Seattle’s two nontraditional superintendents. In L. Cuban, & M. Usdan (Eds.). Powerful reforms with shallow roots: Improving America’s urban schools (pp. 54-76). New York: Teachers College Press.